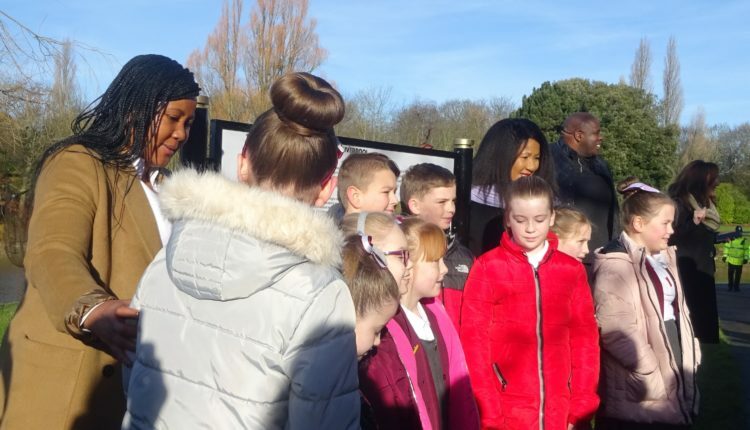 Members of Nelson Mandela’s family visited Princes Park in Toxteth today for a ceremony at the site of the soon-to-be erected memorial to the great revolutionary leader: a new ‘Freedom Bridge’ crossing the lake near Windermere Terrace, a planned pavilion and 32 cylindrical stoneworks inscribed with inspirational Mandela quotes. 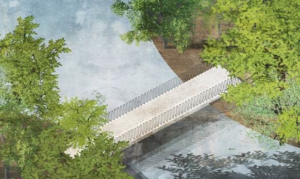 Pedestals, representing the the oil drums Mandela used to grow an allotment on the rooftop of Pollsmoor Prison, were also included in the designs. The former President’s eldest daughter Dr Makaziwe ‘Maki’ Mandela and his granddaughter Tukwini Mandela visited Princes Park to offer their blessing at the site of the new memorial and will attend further events Tuesday and Wednesday this week. The visit was organised by the Mandela8 group in conjunction with Liverpool City Council and follows a trip by the group to South Africa in the summer, where they received approval from the Mandela family for the designs. At that visit, the city of Liverpool was also gifted a set of limited edition prints known as the Struggles Collection, which are now on permanent display at Liverpool Town Hall. Louise Ellman MP and Mayor Joe Anderson were amongst those in attendance for the event, alongside children from Bellerive School, St Silas and St. Michael’s-in-the-Hamlet primary schools. Phil Jennings of Uniglobal Union, whose organisation has been a long-time supporter of the project spoke of how today was particularly auspicious as February 11th marks the 29th anniversary of ‘the day Nelson Mandela was himself released from prison’. Phil Jennings discussed his own visit to Robben Island, where Mandela was imprisoned, and the isolation of that place, surrounded by shark-infested waters ‘where there were also sharks on land … here you have Mandela island in the background, and there will be a bridge to this island’ he said. Dr. Maki Mandela, in offering her blessing for the memorial in her father’s honour spoke of the ongoing struggle for global equality, ‘unless we are all free, none of us are free’ she said. Joe Anderson, Mayor of Liverpool and Sonia Bassey MBE, Chair of the Mandela8 group were also among speakers at the event. Nelson Mandela, a leading figure opposing the apartheid regime in South Africa, was imprisoned for 27 years, and went on to become South Africa’s first black President, campaigning for equality and human rights globally, a leader who has and will continue to inspire many for generations to come. Nelson Mandela was given the Freedom of the City in 1994, and since his death in 2013, Mandela8 has been campaigning for a permanent memorial to the South African president and great leader. Today’s event was part of a three-day official visit to the city, which includes attending a TUC fundraising dinner on Wednesday. PLEASE HELP! THE WIRRAL ANIMAL SANCTUARY NEW PREMISES FUND!